This scrappy Double Four Patch is an easy quilt pattern that's suitable for all quilters. The pattern definitely put those extra scraps of leftover fabrics to good use. Some might recognize the blocks in this quilt. It was assembled with a portion of the blocks gifted by forum members. We have many more blocks to sew into a larger quilt that coordinates with this 25-block version. The Finished Block Size are 8-inch squares for a 40" x 40" inch finished quilt. 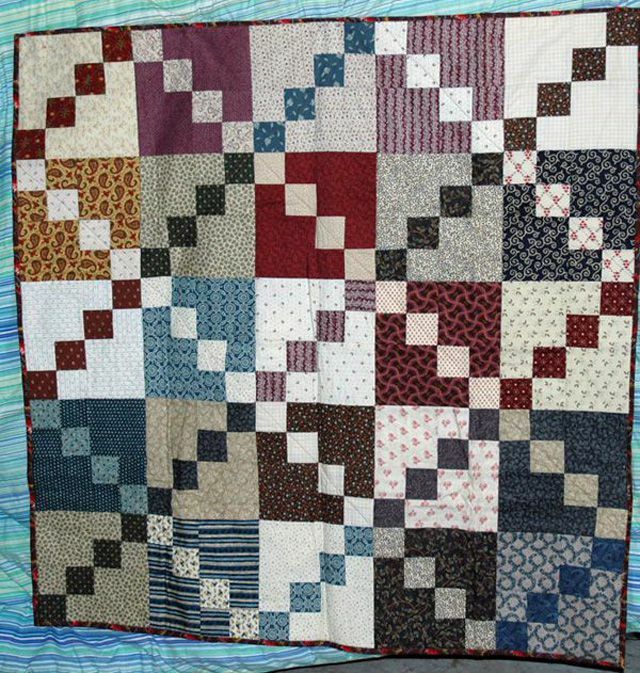 Quilting forum members made the same quilt block for a past swap event but constructed their blocks in pairs of two. Each block in the pair was sewn with the same two fabrics, a blue and a white, but fabric positions were flip-flopped to create 'negative' and 'positive' layouts. Take a look at the pattern for those Double Four Patch quilt blocks. If you'd like a more orderly quilt, refer to the previous block pattern's last page to find yardages and cutting instructions for two quilt sizes. Read through the entire pattern before choosing and cutting fabrics, to make sure you understand the process. Like other quilt blocks, the Double Four Patch's design becomes obvious when contrasting fabrics are sewn in specific areas. A portion of the blocks is sewn with predominantly dark fabrics, with light squares positioned along the diagonal. Remaining blocks are sewn in the reverse layout. The 'light' and 'dark' fabrics in our blocks all vary somewhat in contrast, and we love the results. If you prefer, use the same light fabric throughout to tie the darker scrap fabrics together. Choose a variety of dark fabrics, and remember that warm colors (such as versions of red, pink and orange) can move forward in the design to have the same―or more―impact as a dark. See: Color Wheel Simplified and Color Value for Quilters for more information. It's fine to repeat some of the darker fabrics, but do follow the links to the previous pattern if you prefer to make a less scrappy quilt. You will need 13 light fabric swatches with a usable size of at least 10" x 11", or equivalent. Or larger swatches of fewer fabrics. You will need 12 dark fabric swatches with a usable size of at least 10" x 11", or equivalent. Or larger swatches of fewer fabrics. Cut enough for one test block before cutting all fabric. Place (2) like 4-1/2" squares in each of the 13 piles. Add a matching 2-1/2" x 10-1/2" light strip to each pile. Add a dark 2-1/2" x 10-1/2" strip to each pile. Place (2) like 4-1/2" squares in each of the 12 piles. Add a matching 2-1/2" x 10-1/2" dark strip to each pile. Add a light 2-1/2" x 10-1/2" strip to each pile. Binding: about 185 running inches of doublefold binding to finish at 1/4"
To make predominantly light versions of the Double Four Patch quilt blocks, work from the 13 piles set aside for those blocks. Instructions are for chain piecing. Make sure your quarter inch seam allowance is accurate before sewing lots of units. Sew a 2-1/2" x 10-1/2" light strip from a light block group lengthwise to the dark strip of the same size in the group. Without breaking threads, feed another light / dark pair (from another group) through the machine. Repeat until all 13 pairs are sewn (this is chain piecing). Break threads and remove from the machine. Snip threads between the strip pairs. Place sewn pairs on the sewing machine, dark strip up, keeping them in order to easily match-up the light strips to the 4-1/2" light squares in each of the 13 groups. Lower a hot iron onto each (unopened) strip to set its seam (this helps remove puckering and improves accuracy when strips are pressed open). Flip the dark strip right side up with your fingers and carefully move the point or side of the iron into the seam to press the strip into place. Turn the unit over and press from the back. Turn right side up again and check to make sure the seam is pressed adequately. Measure the strip set. Each strip in the strip set should now measure 2-1/4" in width. If they do not, press again and recheck. If still off, practice sewing a quarter inch seam allowance. Press all strip sets in the same manner. Square up one end of a strip set. Beginning at the squared-up end, cut (4) 2-1/2" segments from it, top left illustration. Strip length allows 1/2" for squaring up. Repeat for all strip sets. Sew two like-segments together, flipping one around so that like-fabrics are positioned diagonally from each other. Press seam allowance either direction. Repeat with remaining two segments (top middle and right illustrations). The four patch units you just created should measure 4-1/2" x 4-1/2". Place the four patch units on their coordinating light pile. Repeat to make four patch units for each group. Starting with any group, Gather two light 4-1/2" squares and the two four patch units. Arrange into two rows as shown lower left, taking care that dark squares flow diagonally as illustrated. Sew the components of each row together. Press seam allowances towards the large squares. Join the rows. Press seam allowance either direction. The quilt block should measure 8-1/2" x 8-1/2". If it does not, try one of our easy ways to square up quilt blocks. Repeat to assemble all (mostly) light Double Four Patch quilt blocks. The (mostly) dark versions of the Double Four Patch quilt blocks are sewn in the same way as their light counterparts. Refer back to page 2 if necessary for detailed instructions, and follow the illustrations above. Construct strip sets from the dark and light 10-1/2" strips in each group. Press as for previous blocks and cut four 2-1/2" segments from each. Construct two four patch units from each group of four segments. Arrange dark 4-1/2" squares and four patch units into two rows, as shown above, bottom left. Light squares should flow on the diagonal. Join the components of each row and press seam allowances towards the large squares. Join the rows and press seam allowances either direction. Construct 12 (mostly) dark Double Four Patch quilt blocks. Each should measure 8-1/2" x 8-1/2". You should have 13 mostly light and 12 mostly dark Double Four Patch quilt blocks. Arrange the quilt blocks into five rows as shown, each row with five blocks. Rows 1, 3 and 5 are the same and begin and end with light versions of the quilt block. Examine the row layout from a distance. Are blocks as shown? Do you like the arrangement? If not, shuffle blocks around and examine again. If you wish, choose an entirely different layout for the quilt blocks. Sew blocks in each row together. Press new seam allowances in adjoining rows in opposite directions. Join the rows, matching all seam intersections. Press the quilt top. Mark for quilting if necessary. Our quilt is quilted with very simple diagonal lines. Sandwich with batting and backing and baste. Quilt and bind. A quilt hanging sleeve can be added when the binding is sewn to the quilt or after the quilt is complete. This version of the Double Four Patch quilt is a bit more balanced, with the light and dark diagonal squares forming the look of complete 'squares on point' throughout and at the edges of rows. Use the same block instructions to make this 48" square quilt, but sew an extra row at the bottom and add an extra quilt block to the right edge of each row as illustrated. Make 18 of each block type. Use the instructions referenced earlier to increase the size of backing, batting and binding.